On the 16th Oct 2010 I left my car behind at a campsite where I camped the first night, I paid extra to leave my car a second night. From then on you see the scary ridges of Striding Edge which for some reason my camera never left my pocket I think it was the fear of needing both my hands the whole way up, a big regret not getting some photos or video footage of the famous scramble. Some summit photos as u can see the usual poor weather. Checkout my Vid and thanks for viewing. Helvellyn (Archaic: Helvillon, probably from Cumbric: hal (moor) + velyn (yellow)) is a mountain in the English Lake District, the apex of the Eastern Fells. 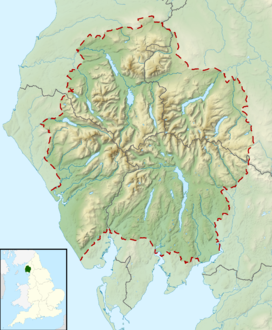 At 950 metres (3,117 ft) above sea level, it is the third highest peak in both the Lake District and England. The traditional border of Cumberland and Westmorland lies along the Helvellyn Ridge. The peak of Helvellyn is the highest on the north-south ridge situated between the Thirlmere valley to the west, and Patterdale to the east. This ridge continues north over Helvellyn Lower Man, White Side, Raise, Stybarrow Dodd, Great Dodd and Clough Head, and south leads to Nethermost Pike and Dollywaggon Pike. The eastern side of the fell is geographically the most dramatic. Two sharp arêtes lead off the summit, Striding Edge and Swirral Edge, either side of Red Tarn. 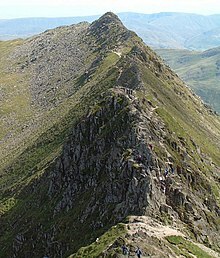 The knife-edged Striding Edge provides one of the best-known scrambles in Lakeland, while the Swirral Edge ridge leads to the conical summit of Catstycam. Nestling between the encircling arms of Helvellyn's two edges is Red Tarn. This pool is named for the colour of the surrounding screes rather than its water and contains brown trout and schelly, a fresh-water herring. The depth of Red Tarn is now about 80 feet (25m), although in the mid-19th century it was dammed with boulders to increase capacity. This was carried out to provide additional water to the Greenside lead mine in Glenridding and the water race is still visible as it crosses the slope of Birkhouse Moor. A second tarn once existed in Brown Cove between Swirral Edge and Lower Man, but this now is reduced to a couple of small pools widening the stream. Brown Cove Tarn was another creation of the Greenside mine after a stone-faced dam was built around 1860. The dam is still in place, but water now leaks through the base and the extended tarn-bed is a smooth patch of luxuriant turf. A water leat passing beneath the north face of Catstycam to Red Tarn Beck can still be traced, although it is now in ruins. Water from Brown Cove and Red Tarn unites beyond Catstycam to form Glenridding Beck, flowing on through the village to Ullswater. The western slopes are relatively shallow and partially forested, with many gills leading down to the Thirlmere valley. A panoramic view of the ascent of Helvellyn with Striding Edge on the left, then a steep scramble to the summit followed by a scrambling descent via Swirrel Edge on the right, leading to Catstycam. The summit of Helvellyn takes the form of a broad plateau about 500 metres (1,640 ft) long. The highest point is marked by a cairn and a cross-shaped dry stone shelter; to the north is an Ordnance Survey [[trig point], slightly lower than the summit at 949 m (3,114 ft). There is a subsidiary top, Helvellyn Lower Man, about a third of a mile to the north-west. Its summit is small compared to the plateau of Helvellyn and offers better views north-westward, as the ground falls steeply away from it on this side. According to Ordnance Survey maps there is a bridleway along the full length of the Helvellyn range taking in a number of Wainwrights. This can be traversed by mountain bike and the usual route is South to North starting from Mill Bridge. This challenging six-hour circular route is 16 miles off road and 10 on road. Geologically, the summit area and Striding Edge are formed by the Deepdale formation of the Borrowdale Volcanic Group. This consists of volcaniclastic sandstone with some intercalcated tuff, pebbley sandstone breccia, and lapilli-tuff. Underlying this is the Helvellyn formation of dacitic lapilli-tuff. Striding Edge is a classic scrambling route on Helvellyn, linking the summit ridge of Birkhouse Moor to Helvellyn's summit by what becomes a sharp arête. Striding Edge begins at Hole-in-the-Wall and then stretches for over a mile to the Helvellyn summit plateau. The initial part of the ridge is relatively rounded and has a good path running along the right hand side. This all changes upon reaching High Spying How, which at 863 m (2,831 ft) is the highest point on the ridge. At this point a narrow path continues closely to the top of the ridge which becomes increasingly narrow. Scramblers, however, will move to the top of the ridge and walk at the very top of the arête. The side path continues until near the end of the ridge where it switches over to the left hand side. Scramblers are forced to descend a short gully down the last tower on the ridge. At this point the ridge joins to the main Helvellyn massif. All that remains is a walk or scramble up loose rocky terrain to reach the summit plateau around two hundred metres from the summit. Typically a cornice will form here in the winter and can represent the most dangerous part of the hike. Striding Edge is a notorious accident spot among hikers and scramblers. Conditions on the ridge in early 2008 were described as the worst in thirty years by fell top assessor Craig Palmer. In winter conditions the climb from Striding Edge up to the summit plateau can involve an icy traverse of a dangerous cornice. Without an ice axe or crampons this presents a serious obstacle. Two walkers died after falling from the ridge in separate incidents in the following weeks. Another walker died after falling from Striding Edge in May 2008. The Lake District national park authority has two 'Fell top assessors' who ascend Helvellyn daily during the winter months of December to March. Their job is to check the weather conditions at the summit and write a report containing information such as temperature, windchill, windspeed, snowdepth, and any dangers such as unstable snow or avalanche hazard and icy footpaths. This report is put on the Weatherline, which is a Met Office mountain weather forecast and is available on the internet, by telephone and at local shops and tourist information centres. This information is important for people who go out winter hillwalking and climbing as it can help them plan their routes and to get an idea of the mountain conditions. Because of the picturesque scenery that Helvellyn offers, many people camp on Helvellyn throughout the year. Many campers will set up camp around Red Tarn as this gives the best views of Striding Edge, Red Tarn, and the summit of Helvellyn itself. The weather should be taken into consideration when deciding to camp on Helvellyn. The weather can change suddenly, mist is also a problem at times. 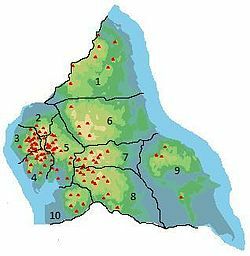 Although wild camping often is tolerated in the upland areas of the Lake District, camping wild is not legal without the permission of the landowner. No trace of the campsite should be left: this includes litter, ground disturbance, and human waste. Helvellyn is strongly associated with the poet William Wordsworth, who used to climb the mountain regularly. Benjamin Robert Haydon's painting Wordsworth on Helvellyn epitomises Romanticism in portraiture. In a sonnet that celebrates both Wordsworth and Haydon, John Keats speaks of the former "on Helvellyn's summit, wide awake..." Wordsworth wrote about the mountain several times. In particular he commemorated the death of the artist, Charles Gough, a tourist in the Lake District. Gough set out with his dog to cross Striding Edge to reach the peak of Helvellyn. He perished there and his dog stood at his side for three months before his corpse was found. A plaque commemorating this event can be found close to the peak. The somewhat flat summit made the first British mountain-top landing of a plane possible, when John F. Leeming and Bert Hinkler successfully landed and took off again, in 1926. An academic, E.R. Dodds (1893–1979), Professor of Greek at the University of Birmingham, recorded the event, signing an old bill (receipt) to that effect, before they took off again. The event is marked by a slate which reads: "The first aeroplane to land on a mountain in Great Britain did so on this spot. On December 22nd 1926 John Leeming and Bert Hinkler in an AVRO 585 Gosport landed here and after a short stay flew back to Woodford". The western slopes bear witness to historic mining activity. Helvellyn (or Wythburn) mine operated from 1839 until 1880, after which the land was acquired for the Thirlmere reservoir scheme. Four levels can be found along the course of Mines Gill, from where lead was extracted. Despite the sizeable workings the venture was never a commercial success. Powered by WordPress v 4.7.13. Page in 0.669 seconds.